One of the most memorable episodes of Top Gear was when they took a Porsche 911 Carrera, BMW 645Ci and Jaguar XKR to Pendine Sands in Wales. The filming was sublime, the commentary entertaining and the sideways action hilarious. I found the footage online recently and what really stuck me was how enthusiastic Richard Hammond was about the 911 calling it, among other things, “rare, visceral and exciting” and “a great car”. He just couldn’t stop gushing over it. You can watch the full feature at the bottom of this page. What’s odd about that, you may be thinking, as Hammond is well known to be a 911 fan? Well, the programme was made back in 2003 so the 911 featured was a Porsche 996. This is a Porsche you can today pick up for less than £15,000 and yet, rewind a few years, and the world’s most popular motoring show was raving about what a superb and complete sports car it was. Go back even further and, on ‘old’ Top Gear, Tiff Needell drove the Porsche 996 when it was introduced and said the all-new 911 was ‘better in almost every way’ with a driving experience that was ‘second to none’. And it wasn’t only Top Gear. Motoring magazines enthused about the way that new-generation 911 had reinvented the 911 legend in a more effective and user-friendly package. Buyers loved it, too, with the 996 sold like hot cakes to people who wanted to live the Porsche 911 dream but had been put off by the compromises of previous models. This was the future – the car that would take the 911 into the 21st century and beyond. So what’s happened? Why has this once aspirational and accompliced driving machine become so unloved and undervalued? The Internet, that’s what’s happened and, ironically, the worldwide web began to have real influence from around 1998 – the year the Porsche 996 was launched. Since then, it’s invaded every corner of our lives. If we want information, entertainment or advice, the first thing we turn to is Google. And type in ‘Porsche 996’ and you’ll soon see links to ‘Porsche 996 reliability’ which, in turn, will take you into those dark and scary places called forums; those 21st century equivalents of barrooms, complete with self-proclaimed experts on every subject under the sun. Venture into a Porsche forum and you’ll soon discover untold horror stories about 996 engines exploding, read how ugly the cars are, and realise that, in fact, a 996 is evil personified and should be avoided at all costs. Phew, no wonder they’re cheap to buy. This is not the place to go into detail about the Porsche 996 engine’s supposed faults so let’s just say that Porsche sold a hell of a lot of these cars and the vast majority are still behaving just fine. OK, there’s a fair chance that you’ll get an oil leak from the infamous rear main seal (RMS) but that’s nothing more than a minor annoyance. Intermediate shaft (IMS) failure is rare, as are scored cylinder bores. It’s interesting to note that the first 996 engine problem to hit the forums – oil and coolant mixing – never seems to get a mention now. It’s as if the problem has just gone away; or perhaps it was never really there in the first place. And what about the 996’s looks? Again, these were lauded when the car came out, although there were some justified grumbles that the front end was too like that of a Boxster, but all of a sudden the 996 has become ‘ugly’. I can’t see why; it has a purity of form that reflects the original 911, bereft of spoilers and fussy detail. It was, perhaps, the introduction of the 997 that made the Porsche 996 look less attractive in some people’s eyes. The newer car looked more like that perennial favourite, the 993, with round headlamps, curvaceous hips and a touch of bling. The forum trolls were quick to make unkind comparisons between the pure 996 and the more stylised 997. Now those opinions have become gospel. Even though the Porsche 997 may have started off as the darling of the forums it’s not escaped the wrath of those who really should get out more and they soon picked up the fact that the first-generation 997 had essentially the same engine as the 996 and, therefore, the same potential issues. So we’ve now reached the stage that people are getting scared off by tales of 997 engines blowing up and prices of early examples are dropping below £20,000 which, in turn, is having a knock-on effect on the 996. The more the doom-merchants talk down these great 911s, the more prices drop and then they get bought by people who can’t really afford to run a Porsche, so the cars don’t get maintained properly and, as a result, they become worth even less. And there in lies another problem; buyers browse the classifieds and see £9,000 996s and £18,000 997s, not realising that they will be bags of nails, and use these examples to argue down the prices of better cars. And so there’s a downward spiral of prices, all because some bloke in an Internet forum had a mate who knew a bloke who’d heard about a 996 engine that exploded. Maybe. Now, I’m not saying that 996s and 997s don’t have problems – they can do if you’re really unlucky – but on the whole they are reliable and tough Porsches that are also a lot of fun to drive and to own. This article first appeared in GT Porsche magazine. 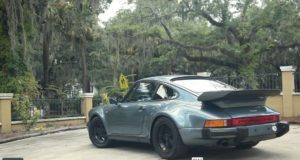 PrevPreviousFuel is dropping in price, so buy a Porsche!